For Steve Silberman and Tommy Cook, owners of Absolute ConcreteWorks (ACW) LLC, their maxim, fusing art with function, is a principle that has yielded limitless possibilities in decorative concrete. The company, located in the greater Seattle, Washington Area, features architectural precast concrete-works including, but not limited to, countertops, sinks (integral, vessel and farm), fireplace surrounds, bathtubs and exterior architectural elements. 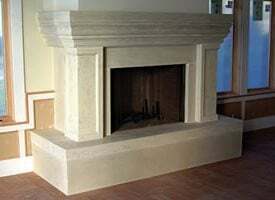 This 16-piece custom precast fireplace was designed for a magnificent waterfront home on Bainbridge Island. ACW's concrete artists developed a technique whereby the marble look even fooled the masons on the jobsite, who couldn't believe it was concrete. ACW works with clients in Washington, Oregon, Idaho, Montana and Wyoming. "We [also] ship anywhere because of crating capability," adds Silberman. "And we have a sister company, Cook's Custom Creations, in Missoula, Montana, owned and operated by Tommy's brother, Michael Cook, which gives us stronger reaction capabilities." Located on Washington's Olympic Peninsula, their design studio, showroom and architectural detail garden are just a short ferry ride from Seattle and Edmonds, or a short drive north from Tacoma. The collaboration between Silberman and Cook came about in an unusual way. Silberman and his wife were doing a large remodel on a waterfront home in Washington, and he recalls, "We got to the kitchen and expected to use granite. After visiting several granite fabricators and talking with the contractor, we decided granite just didn't lend design versatility. Not wanting to look the same as everyone else, we began to explore alternative hard surface options with our designer and contractor. Among the company's we were referred to was one owned by Tommy Cook, a young, talented precast concrete designer and fabricator." shown here, the Silberman' s became partner's in Absolute ConcreteWorks. Is there a better testimonial to first class quality and customer service? Silberman and his wife chose to finish their kitchen in precast concrete, and in the process became friends with Cook. 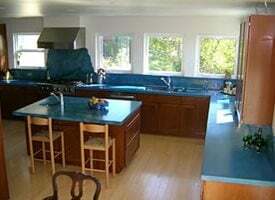 Shortly after completing the Silberman's waterfront kitchen, Cook approached Silberman about investing in the company. "I suggested (after considerable research and market analysis) to Cook that I purchase the company and relocate to much-needed larger facilities, and we became business partners," Silberman explains. "Tommy agreed, and we relocated to an over 6,000-square-foot design/fabrication facility and showroom and got right to business. Our growth has continued and this summer we leased the balance of the building, bringing our indoor facility up to nearly 10,000 square feet with an additional 30,000 square feet outside for sculpture gardens and further expansion." Silberman relies on his more than 30 years of business and marketing experience to help run the business. "Everything we do is collaboration, and we have very different backgrounds we've woven together quickly, and better than I could have ever anticipated we would," he adds. Silberman's wife, Tina, also plays an active role in ACW, bringing the all-important female perspective to the company, where she primarily focuses on working with interior designers who specialize in kitchen and bath color and design. "Each morning I feel like I am going to fun rather than to work. It's great to have passion for what you do and be fortunate enough to earn a living doing what you love," say both Silberman and Cook. Silberman's made a habit of doing what he loves. From 1970 to 1981, he was one of largest manufacturers of skateboards—he owned California Free Former with a business partner, and they also held several licenses from Walt Disney, manufacturing Roller Skates and other Disney brand consumer products. Silberman's previous experience with Disney and Free Former Skateboard brand development contributes to ACW's confidence that their passion and commitment to high-quality creative functional design, coupled with Cook's structural knowledge of his medium (concrete), as well as steadfast customer service, equals a winning formula that over time will establish ACW as a highly sought after brand name. Cook's background includes kitchen and bath design, as well as journeyman-level finish carpentry and precast concrete. "What we do at ACW is finished carpentry in a box, in the negative" explains Cook, adding that 15 years ago, he worked for a large Northwest hardware chain, and after they recognized his capabilities, they made an investment in training him in kitchen and bath design. "One thing that excited me was design," Cook recalls. "I grew up in a small farm town in North Dakota, and while working for the big hardware chain, I finally got a chance to tap into my designer skills." Cook adds that he used to drive his parents nuts as a kid because he would constantly re-arrange his bedroom trying to get the best combination of "cool look" and common sense functionality. "I had no idea that would take me to where I am now," he laughs. 10'x4'x 1" Yep, that's correct ten feet by four feet poured at one inch thick conference table Titled "Sand and Sea" for obvious reasons. Using blue dyes and acid stains for the water, inlays with terrazzo finish for the beach and sea horse bases for the supports, it is everything we can do to not let the clients try to jump in and go swimming. Today, Cook and Silberman are busy working on several projects, including a one-of-a-kind, completely handcrafted bathtub. "The inside is free-formed by hand to resemble a pond," Cook explains. "It's like nothing I've ever seen before." When the customer (a high-end custom home builder) asked about tubs, Cook says, "With the client's idea as inspiration, we came up with a design based on the 'pond' sink in our product line." The "Pond Tub" will be the center piece of the bathroom suite Cook is designing for the home of the custom builder and his wife. "The customer had seen the pond sink loved it and wanted it as a tub, so Tommy built a mini replica mold right then and there," adds Silberman. "We incorporated plumbing into the tub design, so it has a faucet on the wall, but no spout. Instead, there's a pool in the corner that fills with water to create a waterfall effect in the tub." ACW (being licensed, bonded and insured), will help with installation of the tub to ensure everything installs smoothly. 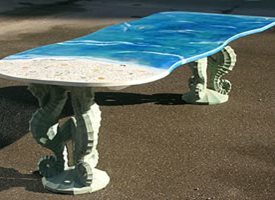 Silberman and Cook are on the leading edge of precast technology and have made a substantial investment in research and development of Glass Fiber Reinforced Concrete (GFRC), which they have incorporated into their product line through the introduction of conference tables and other furniture pieces. ACW plans to further expand their GFRC lightweight precast concrete line in 2006. ACW will be launching a line of semi-mass-produced products later this year, and you can be sure the items will incorporate green building, which both Silberman and Cook feel strongly about. "We have an environmental statement we live by, it's not rhetoric," Silberman says. Cook adds, "When we mix and pour, we utilize every ounce of our concrete, there's never any waste. We use leftovers for smaller jobs like our garden art." ACW also endeavors to utilize products and materials that do not harm the environment. It is their practice to choose sustainable forest products and reclaimed or recycled products whenever practicable, and their mix typically includes fly ash (a by-product from smokestacks) and recycled glass for many of their terrazzo finishes. They also abstain from using tropically harvested rainforest timber, and their finish products, which are environmentally friendly, are water-based and do not pollute the air or give off toxic chemicals. They also use a concrete additive that is made with vanilla beans. ACW frequently utilizes GFRC to make tabletops as thin as ¾-inch thick. "We are able to make large tables and surfaces that require minimal support and are thin," explains Silberman. "We're also in the final stages of research and development of a glass-like surface on concrete that requires no polishing or grinding, and we project it will be introduced by spring 2006." In the meantime, ACW was excited about it's participation in the Seattle Interior Show and recently was very disappointed to learn that the show had been cancelled. When one door closes another one opens. ACW is pleased to have been selected to participate in Showhouse 2005 from September 10 through October 2 at the "Moore Mansion on Millionaires Row" on Capitol Hill in Seattle. Silberman says he's also keeping an eye on the Web, especially sites like The Concrete Network. "[Concrete Network] created a tremendous forum and increases the visibility for our industry," he says. "It's the best resource available to monitor the industry on a regular basis... clearly one of the most important tools our industry has in the tool box." "With The Concrete Network's help, along with our memberships in the American Institute of Architects and the Home Builders Association, our company's recognition is growing fast," adds Cook. With an eye toward the future, which includes a product line that's environmentally-friendly, as well as the chance to be a part of exclusive design shows, ACW is staying true to their convictions—something that's both appreciated and rare.